The accessory navicular also termed the os navicularum or os tibiale externum - is an extra bone or piece of cartilage on the inner side of the foot above the arch that attaches to the posterior tibial tendon within this area. This extra bone, present at birth, is not part of the normal bone structure and found in approximately 10% of the population. Some people with an accessory navicular may be unaware of the condition if symptoms are never experienced. But accessory navicular syndrome is a painful condition caused by aggravating the bone, the posterior tibial tendon or both.Accessory navicular syndrome is an irritation of the accessory navicular and/or posterior tibial tendon. This irritation can be caused by shoe rubbing, trauma, excessive activity, or overuse and can cause problems with the shape and function of your foot. Many people with this disorder also have flat feet which puts more strain on the posterior tibial tendon. Some people are born with an accessory Navicular because during development, the bones of the feet sometimes develop abnormally causing the extra bone to form on the inside of the foot. Adolescence is a common time for the symptoms to first appear. This is a time when bones are maturing and cartilage is developing into bone. Sometimes, however, the symptoms do not occur until adulthood. The signs and symptoms of accessory navicular syndrome include a visible bony prominence on the midfoot (the inner side of the foot, just above the arch) Redness and swelling of the bony prominence. 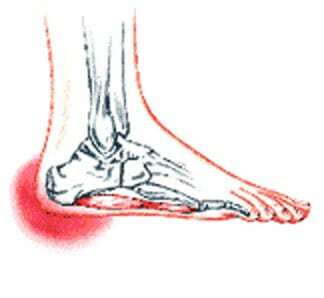 Vague pain or throbbing in the midfoot and arch, usually occurring during or after periods of activity. Excess weight will increase the force on the posterior tibial tendon as it inserts into the accessory navicular and will tend to precipitate or aggravate symptoms. If a patient with a symptomatic accessory navicular is overweight, then losing weight can be very helpful. Even losing 5-10lbs will decrease the amount of force going through the foot with each step by as much as 15-30lbs. This is because the foot acts like a lever serving to magnify the force absorbed by the foot with each step. Some people have more bones in their feet than others. Actually, it?s not all that uncommon to have extra bones in the feet. These extra bones area called accessory bones. The navicular bone, one of the small bones located at the instep or arch of the middle of the foot, is an example of an extra bone people are born with. It?s called the accessory navicular bone. During the maturation process, the navicular and the accessory navicular never fuse into one solid bone, but remain connected by fibrous tissue or cartilage. It is estimated that 4-14% of the population are born with an accessory navicular bone. Most of the time, this condition is asymptomatic and people may live their whole lives unaware that they even have this extra bone. The main reason the accessory navicular bone becomes problematic is when pain occurs. There is no need for intervention if there is no pain. The accessory navicular bone is easily felt in the medial arch because it forms a bony prominence there. Pain may occur if the accessory bone is overly large causing this bump on the instep to rub against footwear. Accessory navicular syndrome is diagnosed by asking about symptoms and examining the foot for skin irritation and swelling. Doctors may assess the area for discomfort by pressing on the bony prominence. Foot structure, muscle strength, joint motion and walking patterns may also be evaluated. Fusion of the accessory navicular to the navicular with screws is required when there is a large accessory navicular bone and removal of this bone would reduce the articular surface of the Navicular to the talus (coxa pedis). Fusion will relieve pain without disrupting the tibialis posterior tendon insertion nor narrowing talar head support. In most instances, a patientâs recovery will be as follows. 0-6 weeks: Immobilization (in case or cast boot) non-weight-bearing or touch weight-bearing. 6-10 weeks: Increasing activity in a cast boot. Physical therapy to work on strength and balance. Full recovery after 9 weeks-2 months. In some patients (where the posterior tibial tendon is still intact and functioning) the treating surgeon may allow weight-bearing as tolerated in a cast boot immediately after surgery. An accessory navicular is defined as an extra bone in the foot, and oftentimes it causes moderate to severe discomfort. Depending on the severity, your doctor may recommend a non-surgical treatment to alleviate the pain, or surgery if treatment doesn?t decrease symptoms. What precipitates the pain? It will usually be caused by rubbing of the skate or other footwear against the prominence. You?ll commonly see blisters or a red irritated area. Other symptoms to look for, especially when you?re treating an older child or adult, include an area of pain along the posterior tibial tendon of the arch and fatigue of the legs. Typically, these patients are not able to participate in sports for a lengthy period of time or you?ll hear them complain of pain and/or soreness after extended activities. Most individuals with a prominent navicular area will have tried accommodating this area with a doughnut pad or adjustments to their skate. To diagnose accessory navicular syndrome, medical staff ask about the patient?s activities and symptoms. They will examine the foot for irritation or swelling. Medical staff evaluate the bone structure, muscle, joint motion, and the patient?s gait. X-rays can usually confirm the diagnosis. MRI or other imaging tests may be used to determine any irritation or damage to soft-tissue structures such as tendons or ligaments. Because navicular accessory bone irritation can lead to bunions, heel spurs and plantar fasciitis, it?s important to seek treatment. 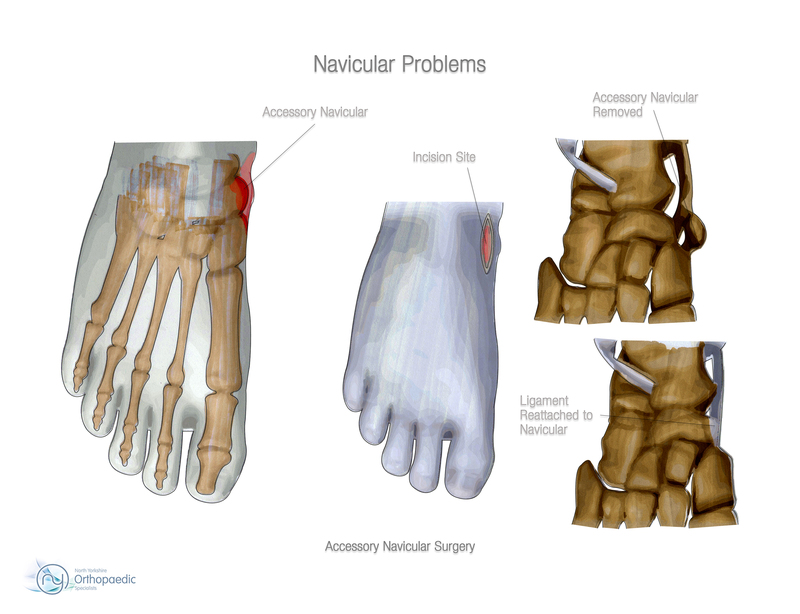 The goal of non-surgical treatment for accessory navicular syndrome is to relieve the symptoms. The following may be used. Immobilization. Placing the foot in a cast or removable walking boot allows the affected area to rest and decreases the inflammation. Ice. To reduce swelling, a bag of ice covered with a thin towel is applied to the affected area. Do not put ice directly on the skin. Medications. Oral nonsteroidal anti-inflammatory drugs (NSAIDs), such as ibuprofen, may be prescribed. In some cases, oral or injected steroid medications may be used in combination with immobilization to reduce pain and inflammation. Physical therapy. Physical therapy may be prescribed, including exercises and treatments to strengthen the muscles and decrease inflammation. The exercises may also help prevent recurrence of the symptoms. Orthotic devices. 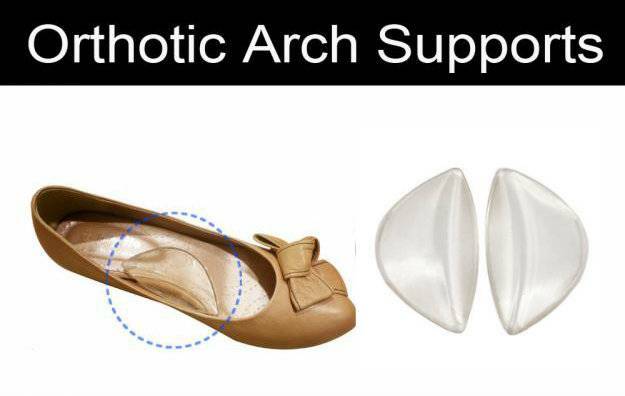 Custom orthotic devices that fit into the shoe provide support for the arch, and may play a role in preventing future symptoms. Even after successful treatment, the symptoms of accessory navicular syndrome sometimes reappear. When this happens, non-surgical approaches are usually repeated. In the original Kidner procedure, the entire posterior tibial tendon was released from the navicular and then rerouted through a drill hole placed through the navicular. The original Kidner procedure is now rarely used as a means of treating an isolated accessory navicular. Instead, a modification of the Kidner procedure has become more commonplace. The modified Kidner procedure consists of carefully removing the accessory and anchoring the posterior tibial tendon to the surface of the navicular where the accessory was removed. The repair may be done by passing a suture through the tendon and then through drill holes in the navicular, or by using a suture anchor. The human body is rarely the same from person to person. Some things stay the same, like the function of the internal organs. Even when structures are similar, however, little variations, like extra bone tissue, can make a significant difference in the body. Having small, extra bones is not as uncommon as you might think. Sometimes, though, these additional tissues can cause painful problems, as with accessory navicular syndrome. Accessory navicular syndrome as it is called can result from a number of causes, excess or overuse syndrome as seen in an athlete. Trauma to the foot as in an ankle sprain or direct trauma to the navicular bone. chronic irritation from shoes rubbing against the extra bone, over time, may cause pain. Excessive pronation which strains the attachment of tibialis posterior muscles into the navicular bone. Keep in mind, the larger the actual accessory bone, the greater the chance of it becoming an issue. 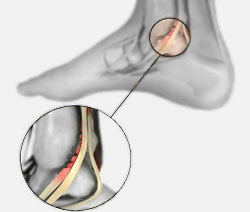 If you develop accessory navicular syndrome, you may experience a throbbing sensation or other types of pain in your midfoot or arch (especially while or right after you use the foot heavily, such as during exercise), and you may notice a bony prominence on the interior of your foot above the arch. This prominence may become inflamed, which means it will likely feel warm to the touch, look red and swollen, and will probably hurt. Using PRP treatments, orthotics, proper running shoes and physical therapy should do the trick. No long recovery, no long down time. My runners and athletes are usually back to their sport pain free within a month. The key is eliminating the syndrome, not the bone (or cartilage). There are not one but two different kinds of leg length discrepancies, congenital and acquired. Congenital indicates that you are born with it. One leg is structurally shorter in comparison to the other. As a result of developmental periods of aging, the brain picks up on the walking pattern and identifies some difference. Your body usually adapts by dipping one shoulder to the "short" side. A difference of under a quarter inch isn't grossly uncommon, doesn't need Shoe Lifts to compensate and generally does not have a serious effect over a lifetime. Leg length inequality goes mainly undiscovered on a daily basis, however this condition is very easily fixed, and can eliminate a number of cases of chronic back pain. Therapy for leg length inequality typically involves Shoe Lifts. These are typically low-priced, generally costing below twenty dollars, in comparison to a custom orthotic of $200 or maybe more. When the amount of leg length inequality begins to exceed half an inch, a whole sole lift is generally the better choice than a heel lift. This prevents the foot from being unnecessarily stressed in an abnormal position. Lower back pain is the most prevalent condition affecting people today. Around 80 million men and women are afflicted by back pain at some stage in their life. It's a problem which costs businesses millions of dollars every year on account of time lost and productivity. New and superior treatment solutions are constantly sought after in the hope of reducing the economic impact this condition causes. Men and women from all corners of the world suffer from foot ache as a result of leg length discrepancy. In these cases Shoe Lifts might be of beneficial. The lifts are capable of relieving any pain and discomfort in the feet. Shoe Lifts are recommended by numerous certified orthopaedic orthopedists. In order to support the human body in a well-balanced manner, the feet have a very important function to play. Irrespective of that, it is often the most overlooked zone of the body. Many people have flat-feet meaning there may be unequal force placed on the feet. This causes other body parts like knees, ankles and backs to be impacted too. Shoe Lifts guarantee that the right posture and balance are restored. There are not one but two different types of leg length discrepancies, congenital and acquired. Congenital indicates that you are born with it. One leg is anatomically shorter in comparison to the other. Through developmental periods of aging, the brain picks up on the gait pattern and identifies some variation. The body typically adapts by dipping one shoulder over to the "short" side. A difference of less than a quarter inch isn't very uncommon, doesn't need Shoe Lifts to compensate and ordinarily does not have a serious effect over a lifetime. Leg length inequality goes typically undiagnosed on a daily basis, yet this issue is easily corrected, and can reduce numerous instances of back pain. Treatment for leg length inequality usually consists of Shoe Lifts. These are typically cost-effective, in most cases being under twenty dollars, in comparison to a custom orthotic of $200 and up. When the amount of leg length inequality begins to exceed half an inch, a whole sole lift is generally the better choice than a heel lift. This prevents the foot from being unnecessarily stressed in an abnormal position. Chronic back pain is the most prevalent condition afflicting men and women today. Over 80 million people are affected by back pain at some point in their life. It's a problem that costs companies millions every year due to time lost and output. Fresh and more effective treatment solutions are continually sought after in the hope of reducing the economic influence this issue causes. People from all corners of the world experience foot ache due to leg length discrepancy. In these types of situations Shoe Lifts are usually of very useful. The lifts are capable of eliminating any discomfort in the feet. Shoe Lifts are recommended by many qualified orthopaedic practitioners". To be able to support the body in a healthy and balanced manner, the feet have got a very important task to play. Irrespective of that, it is sometimes the most overlooked region in the body. Some people have flat-feet which means there may be unequal force placed on the feet. This causes other body parts including knees, ankles and backs to be impacted too. Shoe Lifts make sure that the right posture and balance are restored.